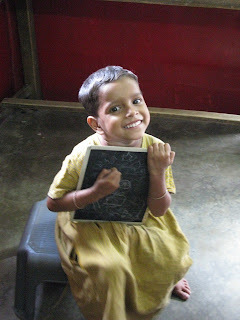 On a previous visit to Kolkata, I met some people from an organisation called Calcutta Rescue. Set up by a British doctor in 1979, it's just one of many NGO's working to assist underprivileged people with healthcare and education. I won't go into too much detail about Calcutta Rescue, as their website has a lot of information about their work and various projects. Last Thursday their adminstrator, Ben Christie, took several people, myself included, on a tour of their clinics and schools that are in Central and North Kolkata. It was a very humbling experience. The first clinic we visited is within the grounds of Loreto Day School at Sealdah, one of the city's main railway stations. They mostly deal with cardio and diabetes, and some cancer patients and see up to 40+ people a day. There is also a vaccination program for children. I was under the impression that these kind of clinics service the local neighbourhood, which they do but was surprised to learn that people also travel from outside of the city, from the rural areas of Bengal where there is little healthcare available for any serious medical conditions. I was amazed to hear that people also travel in to the clinics from other States like Orissa and Bihar. The clinics diagnose and treat people daily, and as most of them rely on daily wages, Calcutta Rescue also gives them assistance for travel costs and provides a food package to ensure that they and their family will eat that night. Next stop was Chitpur, in the far north of Kolkata on the river. This is their leprosy clinic, which is set up in the morning and taken down every night. This tedious daily process ensures the life of the clinic, as Ben explained to have one set up permanently would mean that in order to access the services, people would inevitably end up living there. That situation could create problems and even threaten closure of the clinic. So this is a better solution. Leprosy is a curable disease but treatment can take up to a year or more, provided people with the disease can continue with their treatment daily. As you may be able to imagine, this is not always a simple thing. The doctor, clinic supervisor and volunteer nurses all work with the patients to help them maintain the treatment, to the point of going out to find people if they don't come back for ongoing treatment. Here as well people are diagnosed, given medication and also have their wounds dressed. It is a very practical set up, for example there is a shoe-maker at the clinic every day who individually fits the patients with soft shoes made from a micro-fibre material, a bit like neoprene. Incredibly important as when the disease progresses, the feet in particular lose all feelings. These shoes prevent injury and also make mobility a whole lot easier. I was very moved by this place, and the staff who work here. The handicrafts workshop is also in the north of Kolkata. They have a group of about 10 people making items such as books, bags, cards and cushion covers are made. There are also weaving workshops outside the city in Canning where the fabrics are made into clothing given to the children. Both these workshops train both women and men in sewing skills to assist with giving them income opportunities. And finally, Tala Park is where the first health clinic began and has now grown into the largest one. They treat around 120+ people a day. It was very busy, and like the one at Sealdah, people travel here from all over the city and from rural areas. Again, heart-rending. We met a boy, about 8 years old who had received second degree burns to his upper body and face. He wore a baseball cap but happily removed it to show that he had pretty much made a full recovery. There is a school next door, with about 120 children in their 'formal' education program (structured classes and curriculum) and 65 in their 'informal' program. The informal program works with younger children to encourage them to have fun and enjoy learning and thereby getting them into the 'formal' program. It was obviously a huge success from the kids we met there. They were all busy drawing on chalkboards. Most of the children here come from the 'bustees' or very poor areas. All children are given their lunch time meal before school finishes for the day.